What could be more Thinglish than eating strawberries and cream beneath the Christmas tree than well… growing your own fruit in a strawberry tower in Thailand? This time of year is strawberry season in northern Thailand around Chiang Mai, Chiang Rai and Mai Sirong. 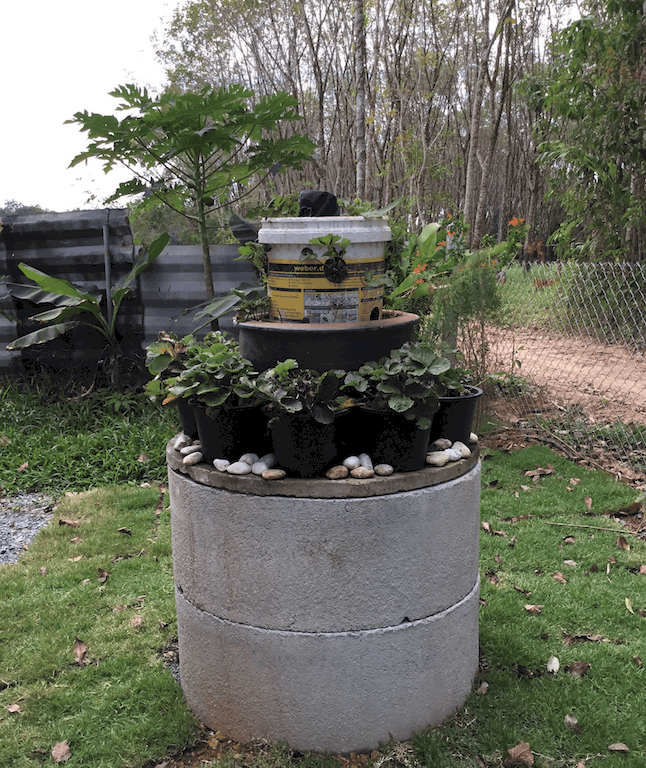 We enjoyed eating the fresh fruit and visiting the farms last year so much, this year we decided to see if we could grow our own strawberries in a tower at our home in Trat province. We bought 20 or 30 plants from a local nursery and even a road side vendor and set out to build a strawberry tower that also had a central vermiculture tower running through the middle of it. The tower has a number of holes drilled into to it to allow our red wriggler worms to freely roam and the top consists of a piece of cloth that keeps flies out. Organic kitchen waste is dropped in the top to feed the worms who in turn create the vermiculture that feeds the strawberry plants. This is a great closed-loop permaculture system that works out great for the worms, the strawberries and me, as I’m a lazy gardener. I know what you’re thinking ‘some of the strawberry plants are in pots surrounding the main tower’ and you are correct. These strawberries are watered with worm tea from our main worm bin and pond water. To date the plants look healthy and we have allowed them to put out runners and form new strawberry plants. So now we have more than we started with and have transplanted them to the raised beds. Now all new runner shoots, we nip off so the plants put their energy into the fruit and not recreating more plants. The strawberry tower sits on top of our water well. 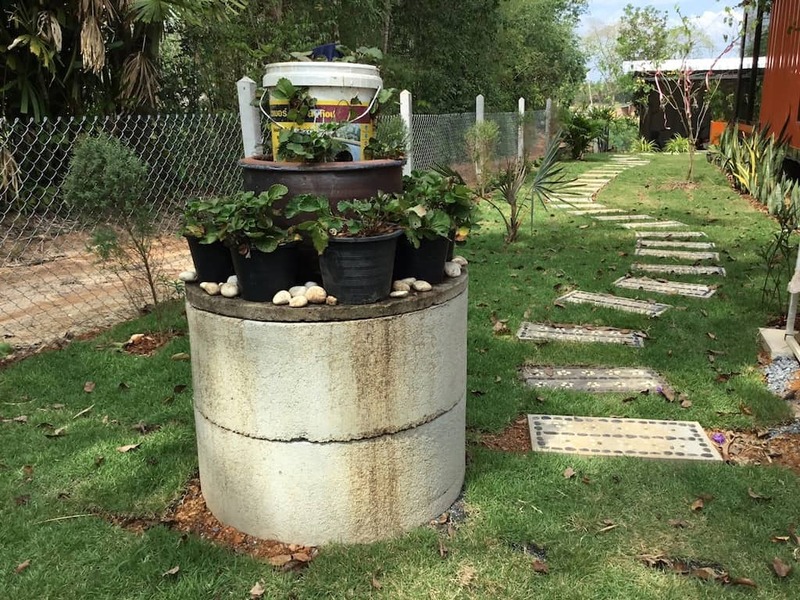 We capped it of and place two concrete cylinders around it. It’s pretty ugly so growing the strawberry plants on and around turns an eyesore into a pleasant looking food source. 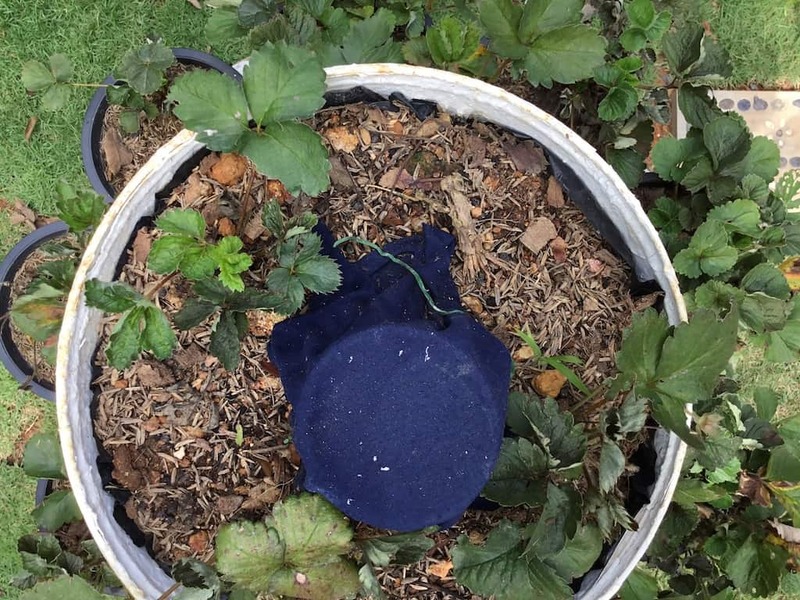 The next step is to add some companion plants in and among the strawberries to help protect them from pests and add beneficial nitrogen and nutrients to the soil. Borage is my herb of choice. I’ve just ordered the seeds so it will be a while before the Strawberries feel the benefits. There is always next season!